HUNTINGTON, W.Va. – Retired U.S. Air Force Col. William Terry Bare recently established the Elinor J. Bare ROTC Scholarship for a full-time undergraduate student entering into the Marshall University Reserve Officer Training Corps (ROTC) program. 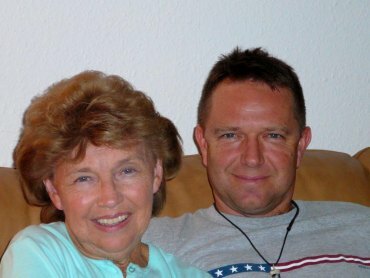 Bare, a 1980 graduate from South Charleston, West Virginia, said this scholarship honors the memory of his mother - a woman whose son's life was changed for the better by his experience and exposure to military culture. He said the scholarship is designed to encourage enrollment in the university's ROTC program with the goal to engender values of patriotism, loyalty and service to the nation. Bare said his mother, Elinor Bare, was a beautiful example of selflessness, kindness and strength. “She was very proud of my service in the military and how it changed my life for the better, and she would be equally proud to know this scholarship will do the same for other young men and women,” Bare said. Commissioned in the U.S. Air Force in 1985 as a second lieutenant, William Bare served for 27 years in a variety of roles as an intelligence officer, political advisor and legislative liaison, as well as in in multiple command assignments. He served in locations with U.S. and NATO forces in Korea, Saudi Arabia, the United Arab Emirates, Germany, Italy and Portugal. As a post-military civilian, Bare recently served as an executive director for a nonprofit organization assisting homeless veterans. He now does private consultation work while continuing his education. When asked what advice he would give to college students today, Bare said it’s as simple as losing the fear of making mistakes. “I had a senior boss in the Air Force who told me something I never forgot. He said, ‘As a leader, I'd rather restrain stallions than push mules.’ In whatever organization you are working, I believe any good leader will appreciate your hard work and willingness to come up with new ideas or ways to get something accomplished. So, if you think you have a good idea--run with it! Be a stallion,” Bare said. For questions about a student’s eligibility for the Elinor J. Bare ROTC Scholarship, please contact the Department of Military Science or the Office of Student Financial Aid at Marshall University.